Actinidia chinensis var. deliciosa (A.Chev.) A.Chev. This attractive climber is grown in temperate gardens for its large heart-shaped leaves and creamy-white, scented flowers, but throughout much of the world it is better known as a commercial fruit. 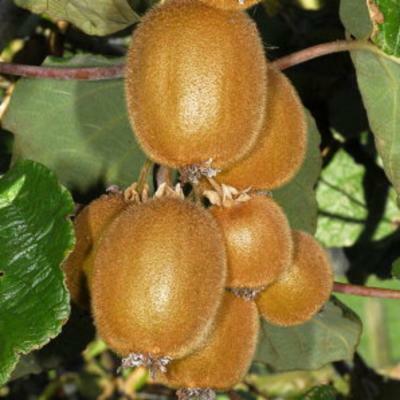 Although native to China, it was commercialisation of this climber in New Zealand (and clever marketing under the name kiwi fruit) that made it the popular and widespread fruit it is today. The species was considered to be a variety of Actinidia latifolia, namely A. latifolia var. deliciosa when first described in 1940 by the French botanist Auguste Jean Baptiste Chevalier (1873-1956). It achieved full species status in 1984 when Liang and Ferguson published the name Actinidia deliciosa but is now referred to as a variety of A. chinensis. Another wild relative, A. kolomikta, also has edible fruits. Native to China, mainly in the southern and central parts, in mountain forests at 800-1400 m. Actinidia deliciosa is widely cultivated in many countries, including New Zealand, Brazil, Chile and Italy. The most common cultivar in commercial production is 'Hayward'. Overview: A dioecious (individual plants are either male or female), vigorous woody vine with large, leathery heart-shaped green leaves up to 25 cm across, which turn a reddish colour in autumn. Flowers: Creamy-white to yellow, slightly scented and up to around 5 cm across. They are produced in the leaf axils in May-June and pollinated by bees. Female plants bear fruit if pollinated. Self-fertile cultivars have been bred. Fruits: The well-known fruit is a brown-skinned, oval berry, up to 8 cm long, covered with fine hairs. The edible flesh is bright green with numerous tiny black seeds. 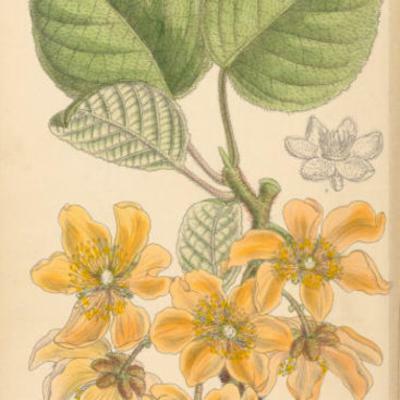 A New Zealand teacher, Mary Isabel Fraser, is credited with introducing Actinidia deliciosa from China to her homeland in 1904 after returning from a visit to a Chinese mission in Yichang on the Yangtze River. She arrived back in New Zealand with seeds of what was then called Chinese, or Ichang, gooseberry, and from these a local nurseryman produced plants that first fruited in 1910. 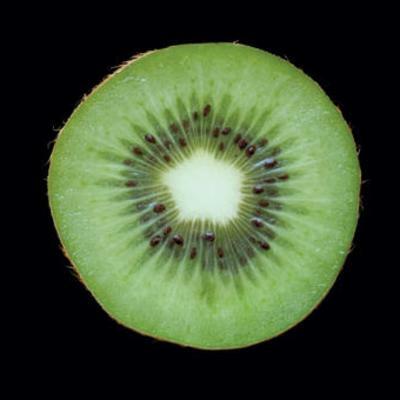 However, large scale commercial fruit production for the international market did not begin until the 1970s when the fruits of improved varieties were successfully marketed using the name kiwi fruit. The crop is now grown not only in New Zealand but also in Brazil, Chile, Australia, Italy (the world's top producer) and elsewhere. In New Zealand it has escaped from cultivation and is considered to be potentially invasive in forests. In China, the fruit is called 'yangtao', meaning 'strawberry peach', and has been cultivated for at least 300 years (there are over 400 varieties in China alone). Wild fruits are also harvested. 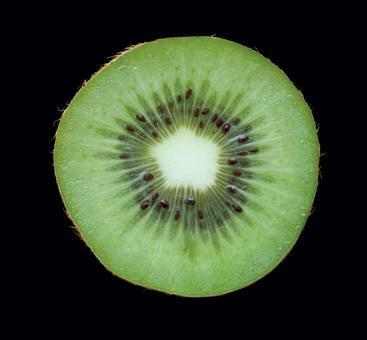 Today, Italy is the world's top producer of kiwi fruit, followed by New Zealand and Chile. The fruit is a good source of vitamin C, vitamin E and a range of B vitamins as well as dietary fibre. Actinidin, an enzyme present in the fruit, can be used as a meat tenderizer. Research indicates that kiwi fruit could be of potential benefit in preventing and halting some processes that lead to cardiovascular disease. Actinidia deliciosa makes an attractive ornamental climber. Actinidia deliciosa can be seen growing in the Berberis Dell at Kew. Fruits and seeds, catalogued under the name Actinidia chinensis , are held in Kew's Economic Botany Collection, where they are available to researchers by appointment. Hairs of fruits can cause throat irritation if ingested, and fruits contain actinidin, an enzyme that can also be irritant. Actinidia latifolia var. deliciosa A.Chev. The Plant List (2010). Actinidia deliciosa. Duttaroy, A.K. & Jørgensen, A. (2004). Effects of kiwi fruit consumption on platelet aggregation and plasma lipids in healthy human volunteers. Platelets 15(5): 287–292. Davis, M. & Meurk, C. (2001). Protecting and Restoring our Natural Heritage – a Practical Guide. Department of Conservation, New Zealand. Vaughan, J.G. & Geissler, C.A. (1997). The New Oxford Book of Food Plants. Oxford University Press, Oxford. Ferguson, A.R. (1990). Botanical nomenclature: Actinidia chinensis, Actinidia deliciosa and Actinidia setosa. In: Kiwifruit: Science and Management. Warrington I. J., Weston G. C. (eds). pp.36-57. 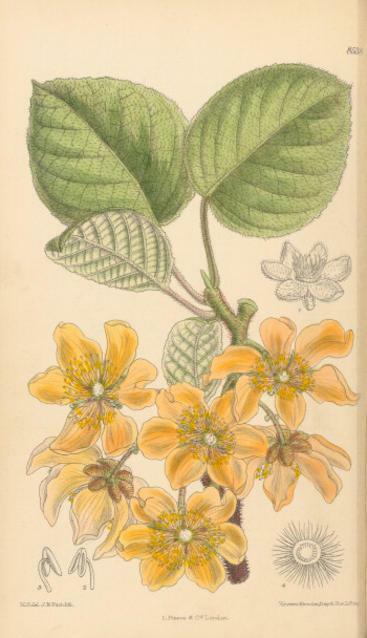 Ray Richards & New Zealand Society for Horticultural Science, Auckland.Flora of China Actinidia chinensis var. deliciosa 12: 334, 350. Morton, J. (1987). Fruits of Warm Climates. Julia F. Morton, Miami, Florida. (The chapter on kiwi fruit is available on the Purdue University website. Ferguson, A.R. (1983). E.H. Wilson, Yichang, and the kiwifruit. Arnoldia, 43(4): 24-35. Schroeder, C.A. & Fletcher, W.A. (1967). 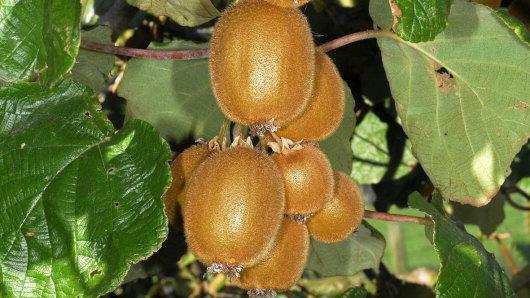 The Chinese gooseberry ( Actinidia chinensis) in New Zealand. Econ. Bot. 21(1): 81-92. Jordaan, M. & Lötter, M. (2012). Taxonomic and nomenclatural notes on the genus Xymalos and general information on the family Monimiaceae Bothalia, A Journal of Botanical Research 42: 51-56.